We want to be the source for all your customized bracket needs. 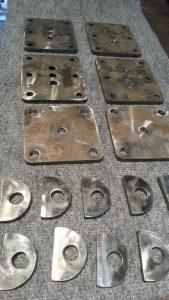 We can produce metal bracket configurations for just about any large project as well as small individual custom brackets with exacting precision. Metal brackets can be used to fulfill a multitude of needs. Our brackets are useful around the house, in the garage, utility closet, workshop, or just about anywhere else that you could use a little organization. We can create a custom bracket that will allow you to get that hard to store piece of equipment in your garage or workshop up onto the wall and off the floor, creating more usable floor space. Custom brackets and hangers will save you time and money when you need to attach that hard to hang sign or special piece of artwork from the ceiling or wall. The uses are almost endless. If the need arises we can even assist you in the design and fabrication of any steel fabricated bracket for custom prototyping. Our precision CNC technology makes the prototyping process extremely cost effective.